Cut all vegetables and cook in the water for 45 minutes. Reduce heat to low, put white wine and all herbs and spices in, continue cooking until liquid reduces to half. Boiled 20g of Nage, reduce low heat and whisk in butter cubes and lemon juice. When well combined, add in red chilli and season with salt and pepper. Add olive oil into a non-stick pan over high heat with diced onion. Add diced garlic, spinach and season with salt and pepper. Combine all hazelnut crust ingredients and mix well. Flatten the mixture and cut to the barramundi fillet size – Freeze until hardened. Add olive oil into a non-stick pan over medium heat. Add in diced garlic cloves and lemon thyme. Pan-fry barramundi skin side down for 2-3 minutes until the skin is brown. Turn the fillet and continue to cook on low heat for another 1-2 minutes. Remove and transfer to a baking tray. 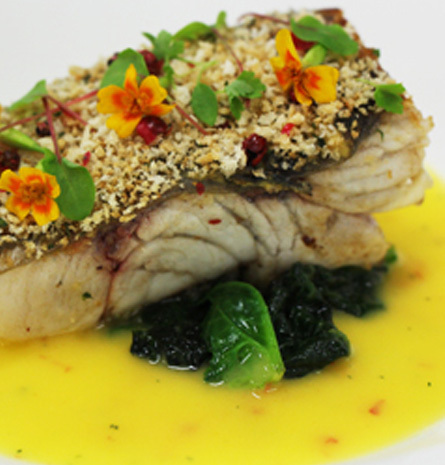 Place the hazelnut crumb mixture on top of the barramundi fillet skin. Heat under the top broiler in oven, on high until the hazelnut crumb turn into crust, this will take about 1 minute. 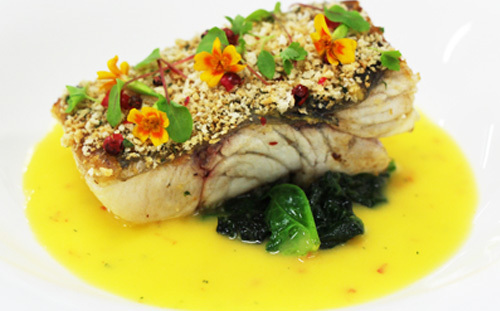 Place the sautéd spinach on the plate and top with the barramundi fillet. Pour the butter sauce and garnish the fillet.